Mars used to be a lot more like our own planet, with lots of oxygen in the atmosphere and water in the ground. 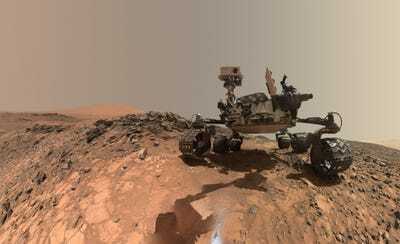 That’s according to new research by NASA scientists, who analysed data from the space agency’s Curiosity rover and discovered a few things that may complicate our search for extraterrestrial life. The rover found high levels of minerals called manganese oxides in its current study area, the Gale Crater, which provided an important clue to the Red Planet’s past. Manganese serves as a good marker for the development of an oxygen-rich environment — our own planet’s geological record shows the same thing when it happened on Earth. Although this finding joins other Earth-like Curiosity discoveries (like evidence of ancient lakes), this addition of oxygen probably didn’t make Mars any more habitable for humans or similar creatures: The oxygen increase may have occurred when the planet’s protective magnetic field was degenerating, as Mars cooled. While the light hydrogen molecules in the water were sucked into the vacuum of space by solar wind, the comparably heavier oxygen molecules remained on the planet. 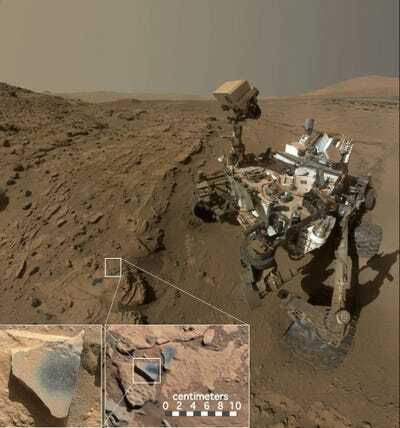 A lot of this oxygen went into Martian rocks, giving them (and the planet) their characteristic rusty, red colour. This finding also offers a new explanation of how a planet becomes oxygenated. Previously, an oxygen-rich environment was treated as a potential sign of extraterrestrial life, but this process on Mars occurs without the help of life forms (much of Earth’s atmospheric oxygen is the product of photosynthetic plants converting carbon dioxide). So while the discovery may make the search for aliens a little more challenging, these manganese deposits show that Mars wasn’t always the bleak, copper-hued desert world we know.